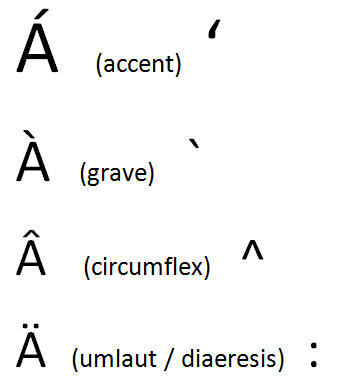 How to enter accented characters, grave, circumflex, umlaut etc when they aren’t on the keyboard. Typing accented letters can be a chore and a mystery, especially for those of us unaccustomed to languages with the ‘extra’ letters. The keyboards don’t show accented letters and it’s not obvious how to type them. It’s good to get a name or word exactly right, if only as a courtesy to the reader. Office and Windows let you enter most any character. The real easy way, especailly with names, is to copy the word (with accented characters) from some source document or incoming email. This ensures you get it right and saves having to work out the keyboard shortcuts to make an accent letter. Sometimes you don’t have to do anything! Office may add some accented characters for you automatically using the in-built AutoCorrect list. Common accents have shortcuts in Office generally (Word and Outlook which uses Word as its email editor). The shortcuts have been there for a long time and the main four are quite logical. An easy way to remember them is … you hold the Ctrl and Shift keys down while pressing the character that represents the type of accent you want. For example pressing Ctrl and Shift plus ^ (caret, usually above the 6 key) then the letter ‘a’ will produce an a with caret above it eg â . Similarly, press Ctrl + Shift + : (colon) then either a, e ,I, o, u will produce that letter with a umlaut above it (which looks like a colon on its side) eg â, ê ,î , ô, û . The same shortcut works for the accent and grave using the apostrophe and grave (usually on top left of the keyboard, below the ~ tilde). Is it Ctrl + ^ or Ctrl + Shift + ^ ? You’ll see the same shortcut written both ways. Strictly speaking the shortcut is Ctrl + ^ but in practice you have to press the Shift key to enter the grave character above the 6 key … in practice the shortcut is Ctrl + Shift + ^ for most keyboards. Another option for inserting accent or other characters is on the Insert tab, Symbol. Choose More Symbols then scroll down to find the character you want. If there is a shortcut for the symbol it will be displayed and even a full name. Most fonts will include accented characters but some might not, especially the free fonts you can download from web sites. If you try to insert a character that doesn’t exist in that font you’ll see a small black rectangle instead. 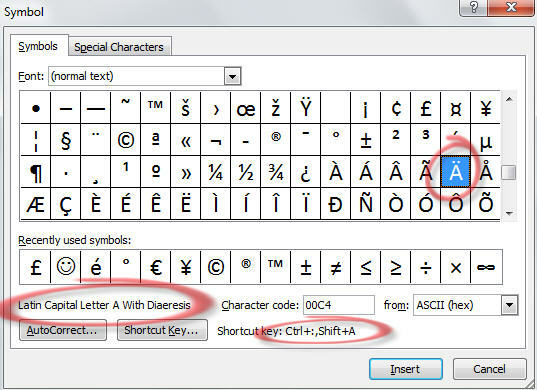 To see the range of letters available in a font, go to Insert Symbol, choose the font and scroll through the list. For non-Office programs you have other choices for entering accented characters. Windows Character Map – is a Windows system accessory usually found on the Start Menu under Accessories | System Tools. It is a lot like the Insert Symbol feature in Office except you can choose characters then copy them to the clipboard for pasting in any Windows program. On-Screen or Virtual Keyboard – we have a special article about the Windows on-screen keyboard which lets you see keyboards for different languages. If you regularly type words from another language the on-screen keyboard might be helpful.